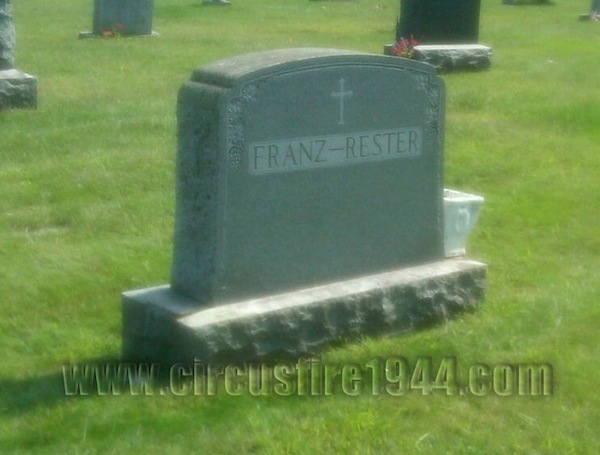 Mrs. Mary M. (Rester) Franz of 456 West Glenwood Avenue, Philadelphia, Pennsylvania, was born March 16, 1914 in Glastonbury, Connecticut, daughter of Hungarian born parents Mary (Knutz) and John J. Rester. She and her son William Franz, Jr., 3, were found dead at the circus grounds after the fire on July 6, and were buried together at St. Mary's Cemetery in South Coventry after services at Killourney Brothers Chapel in Willimantic. 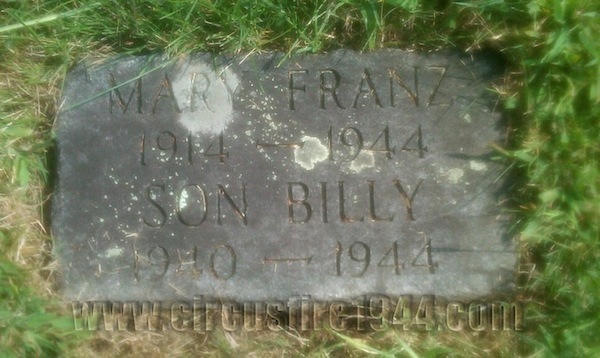 Mrs. Franz leaves her husband William G. Franz, 34; her parents, of South Coventry, with whom she was visiting; and her brothers John Rester, 34, Martin Rester, 32, and Frank Rester, 14. Mary's sisters Rose Rester, 27, and Elizabeth Rester, 24, were also victims of the fire. Another brother, Joseph Rester, passed away in 1932 at age 11. Body #1587 was identified at the State Armory as Mary Franz by her husband William on July 7. Mary and William were married in 1937 in Coventry, and made their home in Philadelphia where Mary worked as a waitress at The Wood School in Langhorne, Pennsylvania, until the birth of their son. Ambitious, bright, and cheerful, Mary was devoted to caring for her family and their home. Her estate was awarded $8,750 by the arbitration board.